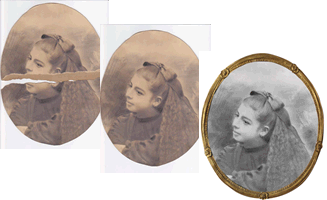 Most of us have some cherished old photographs that have suffered badly from the passage of time. But, thanks to modern technology, these can now be restored to bring back your history to life. 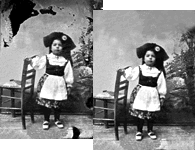 Using a high resolution scanner, I can work from any type of original – B&W and colour prints, slides and negatives of any size, including glass plates. 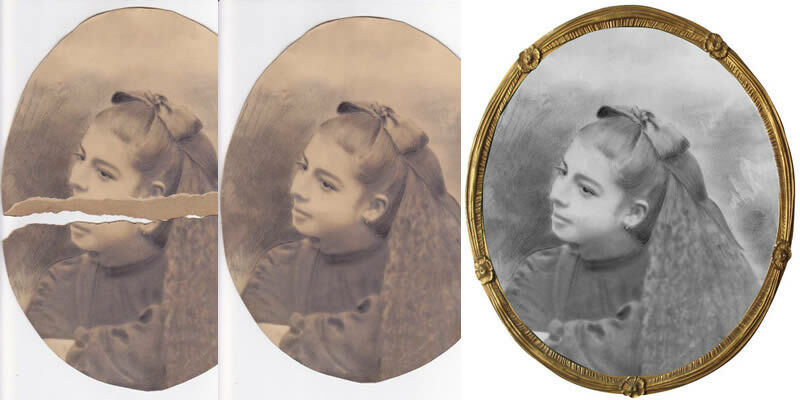 Above: dating from 1898, the original is a rather blurred photo retouched with pencil on a yellowed 26-cm piece of card, cut in an irregular oval and... broken in two! 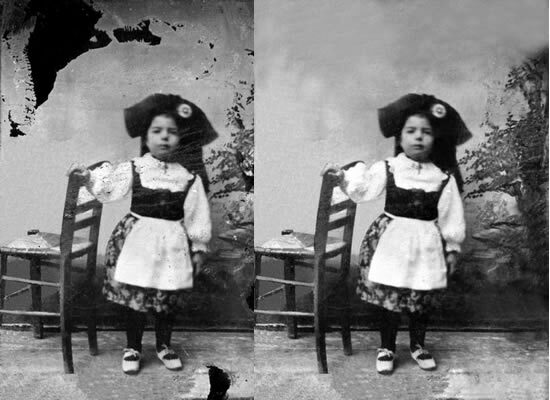 After retouching, I added a pretty (virtual) frame that would have been much to the taste of the photo’s subject - my grandmother. This includes the correction of minor fading or discoloration, simple dust and scratch removal, sharpening and cropping. 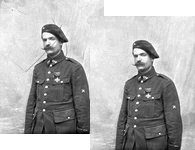 This includes reconstructive work where some areas of the image are missing, and/or there are bad scratches over faces, hands or finely detailed areas(provided the image retains enough information for reconstruction). 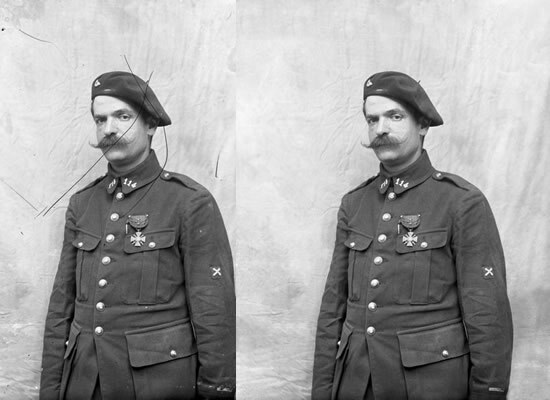 The original of this picture of my grandfather is a 15x10cm glass plate negative with some scratches and light stains. The scratches run across the face but were reasonably easy to eliminate thanks to the large size of the original. 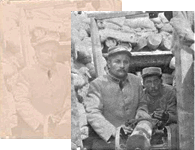 The original of this picture taken in the trenches during WWI is a very faded ID-size print. 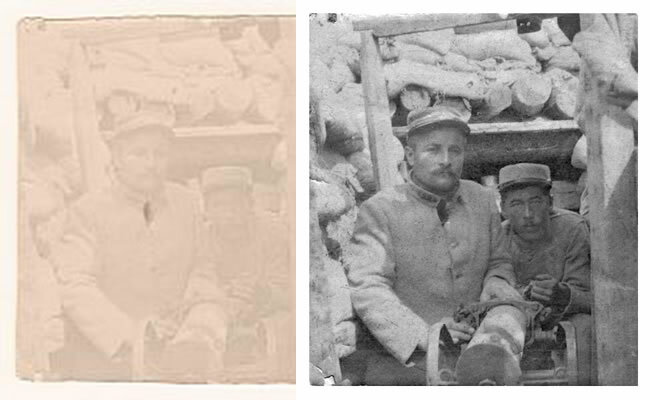 Contrast was restored as far as possible and slight blemishes removed. A little reconstruction was necessary on the face of the man on the right.